I few weeks ago I experienced another first in my life—I went to physical therapy. My hip pain became more than I wanted to endure so I went to the doctor. He prescribed physical therapy. I had no idea what to expect. I left my first visit with three pages of exercises to do at home twice a day. Ok, sure, how hard could this be, right? Not so fast. My physical therapy experience has awakened me to the power and difficulty of the slow and intentional. It has also taught me truths about Jesus and inspired me to be more like Him. Here are a few things I have learned and how I am applying them to my ever-crazy, unpredictable life. Intentionality—Doing my exercises requires thought, presence of mind, and a slower pace. I cannot rush or power through like I used to do on a run. My physical therapist taught me that by being intentional and going slow I am working my muscles. Going through the motions without thought just to finish quickly accomplishes nothing. Jesus made time, took time for people. He didn’t look at the long list of to-do’s for an excuse to rush others. He stopped, looked them in the eye, and listened. I am also learning to make time for other important things or should I say ignore my excuses and make time for important things. My life is unpredictable and many times I don’t have the margin I need to be my best. At those times, I need to be honest with myself about when to give myself a pass and when to push side excuses and distractions and give attention to the important people and things in my life. 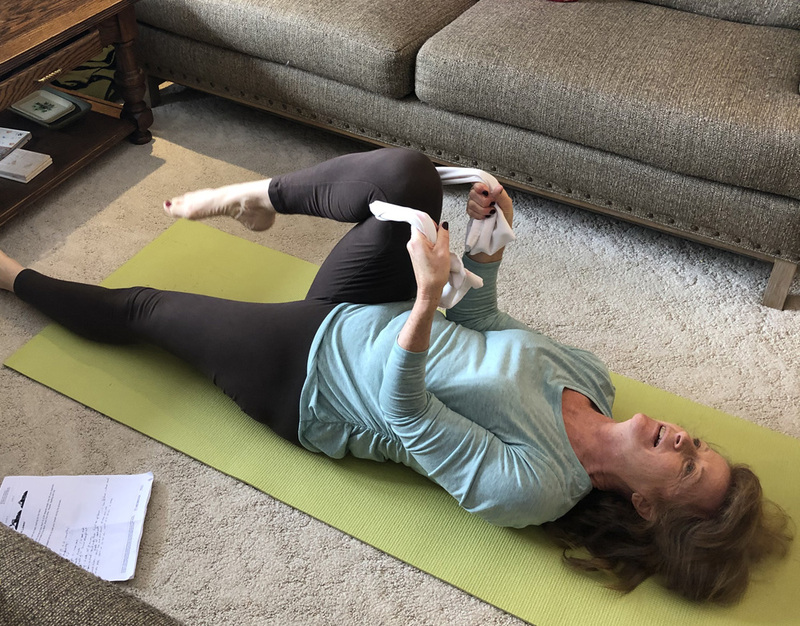 It does matter—When people ask me if my physical therapy is helping, I hem and haw around until I acknowledge the truth—it helps as long as I do my home exercises. I want a once-and-done fix. Physical therapy is an ongoing process and even when I graduate I will need to keep up with some level of exercises to keep my pain at bay. Doing my therapy every day does matter. The results are worth the effort. This is my truth to remember when I’m tempted to not do the work. I am seeing results. They come gradually but they are there. This reality is true in every part of my life. What I do or don’t do affects my life. I’m not talking about legalism where we strive for perfection and expecting a certain result and then feeling guilty when we fall short. I am saying that we need to quit feeding ourselves the lie that our daily choices don’t matter. Just as with my physical therapy, a string of good choices brings a better result than if I had not tried. Relationships are made stronger and richer when I take time with others. I know God better and am more alert to His promptings when I read the Bible and pray throughout the day. Menu planning and conscientious shopping gives me what I need to make healthy meals for the week. Healthy eating brings good health (for the most part). Jesus lived this truth. He knew the little things matter. From gathering leftover food so none would be wasted (Matthew 15:32-38) to blessing the children (Mark 10:14-16) to giving attention to those society marginalized (John 4:4-42), Jesus gave attention to people and details because they matter. The purpose and richness of life do not come in a fast-paced, check-off-the-boxes lifestyle. It comes by slowing down, listening for God’s direction, and living intentionally. I am doing so much better and hope to complete my physical therapy soon. My new challenge will be to continue to live the life lessons learned in the process. This entry was posted in faith, Health, Intentional Living, Joy, Life-giving, Listening to God, Maturing as a Woman of God, Priorities, Time Management and tagged Brenda Garrison author, encouragement, Faith, grandparent, Intentional living, joy, parental relationship with adult kids, parenting, relationships. Bookmark the permalink.